International Women’s Day (IWD) celebrates the opportunities we all have to help women everywhere to realize their potential, improve their economies and succeed at every level. 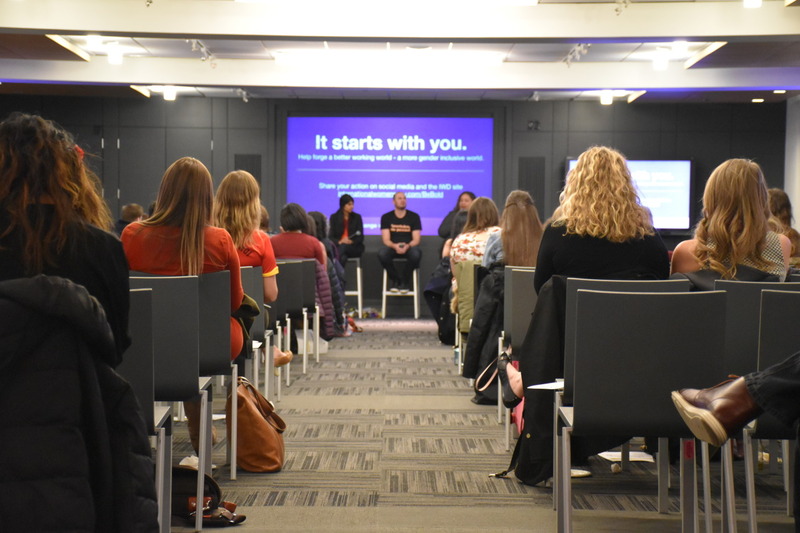 Another well-attended, lively panel discussion took place on Wednesday, March 8 and yes, men were in attendance and are always welcome! Special thanks to generous event sponsor Leo Burnett for facilitating such an inspiring evening and feeding us so well. 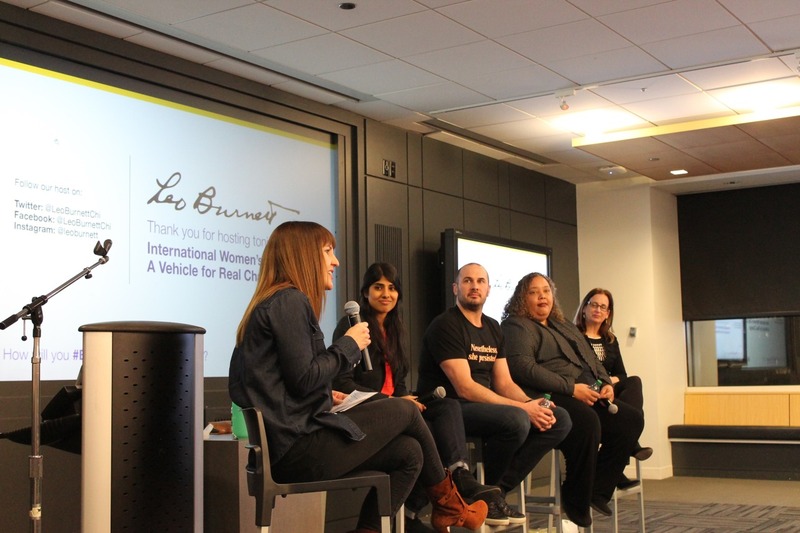 Leo Burnett EVP/Creative Innovation and guest moderator Suzanne Michaels kept the panelists on their toes with challenging questions, and they didn’t disappoint: Design Strategist Pooja Merai from Salesforce, Sandee Kastrul, president and co-founder of i.c. stars, Leo Burnett Chief Creative Officer Britt Nolan and Karen Gordon, founder and chief design facilitator of WE Design Think/50 ACTION 50 Initiative. Suzanne: How did you spend IWD? Is it possible to have a day without women in it? Sandee: This is my third talk today. I’m so glad to be here and what a way to spend the day! That said, it’s hard to have a day without women because women can’t not show up. Pooja: I planned to take the day off, but an event showed up on today’s calendar: a big pitch for my boss’s boss. 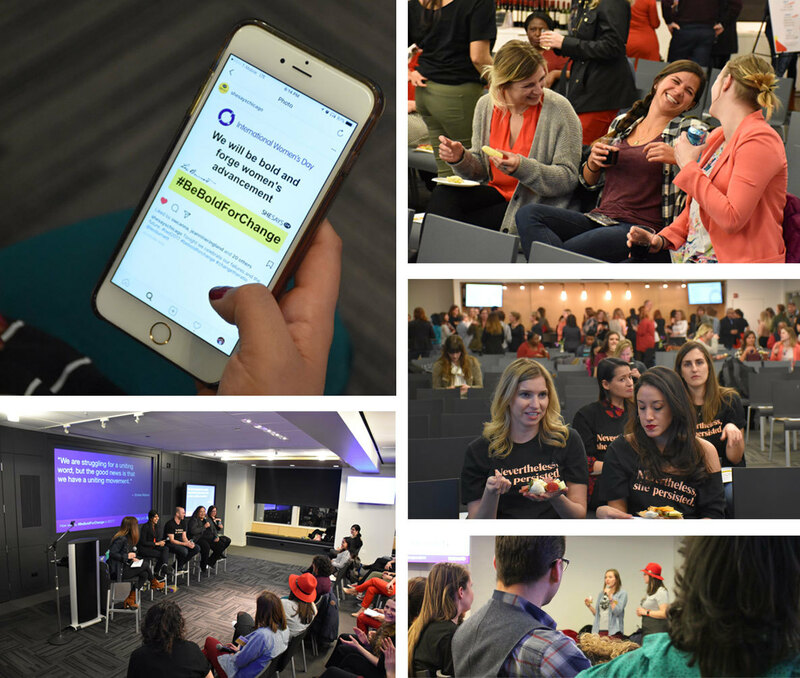 Obviously, it was important, but when I returned from the meeting, our offices created breakout sessions around IWD. I could join any of them. My male co-workers were interested, so that was even better. Karen: I’m not convinced there’s a “right” way to celebrate a day without women. I want to get to the point where we aren’t criticized for what we do - or don’t do. Britt: Today was a strong reminder of how much women contribute to and lead projects, and how much they help others and me. Suzanne: Have you noticed any changes in the workplace, say, in the past few years? 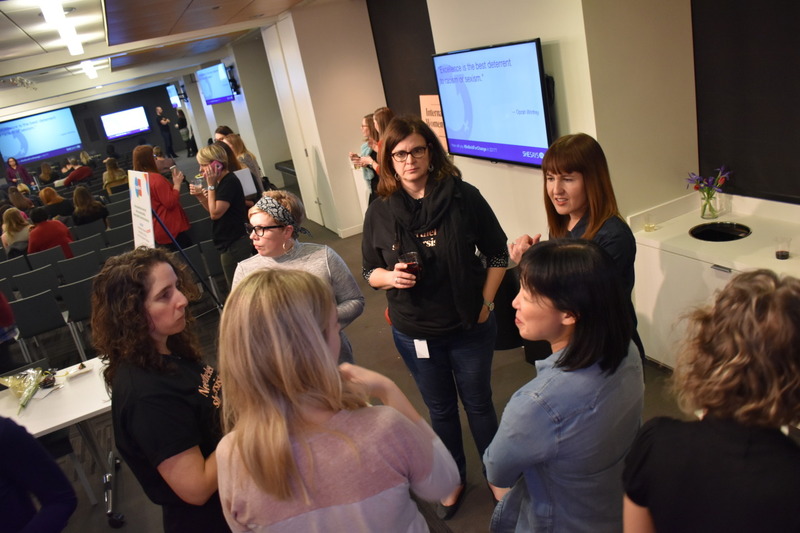 Pooja: There is more awareness of women in the room, which wasn’t always the case. Today’s politics could be responsible for that; it’s definitely affecting conversations. Karen: I spent two years doing ethnographic research before I launched my business. I couldn’t find a pattern between men’s and women’s conversations until I realized no pattern was the pattern. I discovered men were basically scared of really talking to women, and women waited too long to have authentic discussions with men. This is important information and challenges us to reshape our conversational approaches. 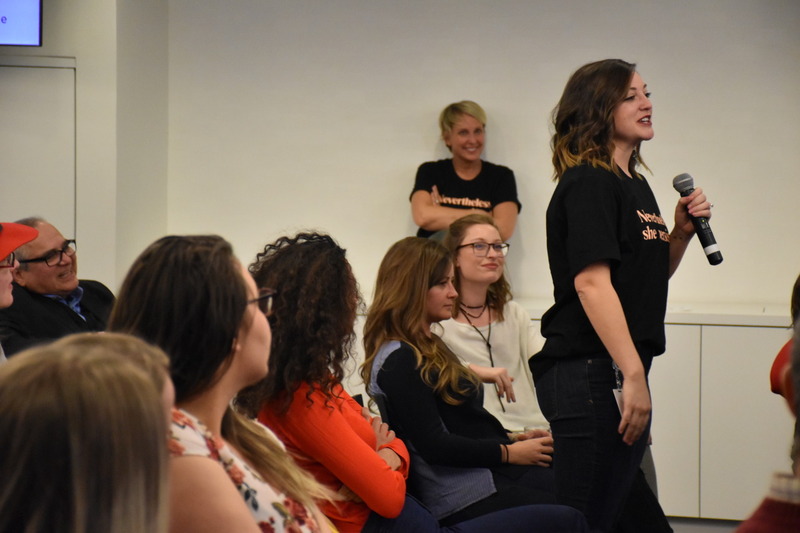 Sandee: I know we have to be open to each other’s experiences, so why don’t we let men explore roles that are typically assigned to women? Because it forces us to step into a place of extreme trust, that’s why. For example, in our office, men are now included on the kitchen cleanup schedule. At first, we all checked our coffee mugs to make sure they were really clean. Then we realized every minute we spent assuming or cleaning, we weren’t building. We weren’t making things. We were just “arriving late” to every conversation. Britt: Yes, I’ve become more conscious of my surroundings and my daily interactions with everyone here. It’s made a real difference when I adapt my thinking and listen to where a person is coming from. Suzanne: Speaking of where you’re coming from, what does diversity mean to each of you? Karen: I’ve discovered a company’s returns are better, so why aren’t teams automatically built this way? Diversity needs to be recognized. Far more ideas get going. Change begins at “a ha”. Pooja: Just like Sandee said, diversity means change, but in my case, change means knowing financial equality. Salesforce has had a series of acquisitions, including the company where I worked (Gravitytank). Lots of new people bring new ways of thinking and working. Our CEO (Mark Benioff) spent $3 million in research to establish equal pay for everyone. I now know I work for a company where I’m paid exactly as someone with a similar role. Suzanne: That’s a great segue to ask if the phrase “the future is female” resonates with you? Sandee: Yes! It means we’re stepping into our light and our power. It means we’re not just fighting for our own needs and wants; we’re fighting for everyone, and that includes men. We really need to show up for the countless people who came before us. Karen: Yes - I’ve even experimented with “owning the street”. I simply walk down the street and don’t move when someone coming toward me is in my path. I actually get smashed more often by men than those who step aside. I’ve started to transfer this “street” stance to daily life. Now I stand in the boardroom like I own it, show up at the table and stand my ground. Literally. Britt: Definitely. Our business is all about finding insights and resonating with a particular audience. Women are a major force, so if we don’t authentically connect with them, they don’t hesitate to tell us. We most certainly listen. Example: Super Bowl spot for Audi featured gender parity, but in reality, the Audi board of directors is all male. Example: Advertisers featured “International Women’s Day specials” – wrong approach, wrong message, bad decision. Posted: April 10th, 2017 under News.